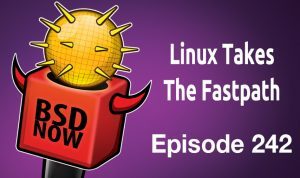 TrueOS Stable 18.03 released, a look at F-stack, the secret to an open source business model, intro to jails and jail networking, FreeBSD Foundation March update, and the ipsec Errata. With the rapid development of NIC, the poor performance of data packets processing with Linux kernel has become the bottleneck. However, the rapid development of the Internet needs high performance of network processing, kernel bypass has caught more and more attentions. There are various similar technologies appear, such as DPDK, NETMAP and PF_RING. The main idea of kernel bypass is that Linux is only used to deal with control flow, all data streams are processed in user space. Therefore, kernel bypass can avoid performance bottlenecks caused by kernel packet copying, thread scheduling, system calls and interrupts. Furthermore, kernel bypass can achieve higher performance with multi optimizing methods. Within various techniques, DPDK has been widely used because of its more thorough isolation from kernel scheduling and active community support. Ultra high network performance which can achieve network card under full load, 10 million concurrent connections, 5 million RPS, 1 million CPS. In order to deal with the increasingly severe DDoS attacks, authorized DNS server of Tencent Cloud DNSPod switched from Gigabit Ethernet to 10-Gigabit at the end of 2012. We faced several options, one is to continue to use the original model another is to use kernel bypass technology. After several rounds of investigation, we finally chose to develop our next generation of DNS server based on DPDK. The reason is DPDK provides ultra-high performance and can be seamlessly extended to 40G, or even 100G NIC in the future. After several months of development and testing, DKDNS, high-performance DNS server based on DPDK officially released in October 2013. It’s capable of achieving up to 11 million QPS with a single 10GE port and 18.2 million QPS with two 10GE ports. And then we developed a user-space TCP/IP stack called F-Stack that can process 0.6 million RPS with a single 10GE port. With the fast growth of Tencent Cloud, more and more services need higher network access performance. Meanwhile, F-Stack was continuous improving driven by the business growth, and ultimately developed into a general network access framework. But this TCP/IP stack couldn’t meet the needs of these services while continue to develop and maintain a complete network stack will cost high, we’ve tried several plans and finally determined to port FreeBSD(11.0 stable) TCP/IP stack into F-Stack. Thus, we can reduce the cost of maintenance and follow up the improvement from community quickly.Thanks to libplebnet and libuinet, this work becomes a lot easier. With the rapid development of all kinds of application, in order to help different APPs quick and easily use F-Stack, F-Stack has integrated Nginx, Redis and other commonly used APPs, and a micro thread framework, and provides a standard Epoll/Kqueue interface. Currently, besides authorized DNS server of DNSPod, there are various products in Tencent Cloud has used the F-Stack, such as HttpDNS (D+), COS access module, CDN access module, etc..
FreeNAS is one of two open source operating systems that my company, iXsystems, develops and distributes free of charge and is at the heart of our line of TrueNAS enterprise storage products. While some of our competitors sell storage software similar to FreeNAS, we not only give it away but also do so with truly no strings attached — competitors can and do take FreeNAS and build products based on it with zero obligation to share their changes. The freedom to do so is the fundamental tenet of permissively licensed open source software, and while it sounds self-defeating to be this generous, we’ve proven that leadership, not licensing, is the true secret to a successful open source business model. We each have our own personal definition of what is fair when it comes to open source. At iXsystems, we made a conscious decision to base FreeNAS and TrueOS on the FreeBSD operating system developed by the FreeBSD project. We stand on the shoulders of giants by using FreeBSD and we consider it quite reasonable to give back on the same generous terms that the FreeBSD project offers us. We could be selective in what we provide free of charge, but we believe that doing so would be short-sighted. In the long game we’re playing, the leadership we provide over the open source projects we produce is infinitely more important than any restrictions provided by the licenses of those and other open source projects. Every company has various levels of management, but leadership is the magic that creates markets where they did not exist and aligns paying customers with value that you can deliver in a profitable manner. Leadership and vision are ultimately the most proprietary aspects of a technology business, over every patentable piece of hardware or licensable piece of software. Whether you create a new market or bring efficiency to an existing one, your leadership is your secret weapon — not your level of control. Jails basically partition a FreeBSD system into various isolated sub-systems called jails. The syscall and userspace tools first appeared in FreeBSD 4.0 (~ March 2000) with subsequent releases expanding functionality and improving existing features as well as usability. + For Linux users, jails are similar to LXC, used for resource/process isolation. Unlike LXC however, jails are a first-class concept and are well integrated into the base system. Essentially however, both offer a chroot-with-extra-separation feeling. + Place the stuff you want to run and the stuff it needs to run somewhere on your filesystem. + Add some basic configuration for the jail in jail.conf. + Fire up the jail. A jail can only see and use addresses that have been passed down to it by the parent system. This creates a slight problem with the loopback address: The host would probably like to keep that address to itself and not share it with any jail. + 127.0.0.1 is an alias for the first IPv4-address assigned to the jail. + ::1 is an alias for the first IPv6-address assigned to the jail. While this looks simple enough and usually works just fine[tm], it is also a source of many problems. Just imagine if your jail has only one single global IPv4 assigned to it. A daemon binding its (possibly unsecured) control port to the loopback-address would then unwillingly be exposed to the rest of the internet, which is hardly ever a good idea. + Finally, it covers the integration with a lot of common tools, like identifying and filter jailed processes using top and ps, or using the package managers support for jails to install packages in a jail from the outside. specify a higher precedence for a rule. This release also includes experimental support for bhyve branded zones. builds for SmartOS (and Triton DataCenter and Manta, as well). > Syzkaller update: Syzkaller is a coverage-guided system call fuzzer. It invokes syscalls with arbitrary and changing inputs, and is intended to use code coverage data to guide changes to system call inputs in order to access larger and larger portions of the kernel in the search for bugs. > Last term’s student focused largely on scripts to deploy and configure Syzkaller on Packet.net’s hosting infrastructure, but did not get to the code coverage integration required for Syzkaller to be effective. This term co-op student Mitchell Horne has been adding code coverage support in FreeBSD for Syzkaller. > kcov provides code coverage collection for coverage-guided fuzzing (randomized testing). Coverage-guided fuzzing is a testing technique that uses coverage feedback to determine new interesting inputs to a system. > kcov does not aim to collect as much coverage as possible. It aims to collect more or less stable coverage that is function of syscall inputs. To achieve this goal it does not collect coverage in soft/hard interrupts and instrumentation of some inherently non-deterministic or non-interesting parts of kernel is disabled (e.g. scheduler, locking). > Mitchell implemented equivalent functionality for FreeBSD – a distinct implementation, but modelled on the one in Linux. These patches are currently in review, as are minor changes to Syzkaller to use the new interface on FreeBSD. > We still have some additional work to fully integrate Syzkaller and run it on a consistent basis, but the brief testing that has been completed suggests this work will provide a very valuable improvement in test coverage and opportunities for system hardening: we tested Syzkaller with Mitchell’s code coverage patch over a weekend. It provoked kernel crashes hundreds of times faster than without his work. year! (Donations between $100,000 – $249,999) It’s companies like NetApp, who recognize the importance of supporting our efforts, that allow us to continue to provide software improvements, advocate for FreeBSD, and help lead the release engineering and security efforts. Foundation Director Philip Paeps went to FOSSASIA, which is possibly the largest open source event in Asia. The FreeBSD Foundation sponsored the conference. Our booth had a constant stream of traffic over the weekend and we handed out hundreds of FreeBSD stickers, pens and flyers. Many attendees of FOSSASIA had never heard of FreeBSD before and are now keen to start exploring and perhaps even contributing. By the end of the conference, there were FreeBSD stickers everywhere! > One particular hallway-track conversation led to an invitation to present FreeBSD at a “Women Who Code” evening in Kuala Lumpur later this week (Thursday 29th March). I spent the days after the conference meeting companies who use (or want to use) FreeBSD in Singapore. staffed by Dru Lavigne, Warren Block, and Deb Goodkin. Our purpose was to promote FreeBSD, and attract more users and contributors to the Project. We had a steady flow of people stopping by our table, asking inquisitive questions, and picking up some cool swag and FreeBSD handouts. Deb Goodkin took some tutorials/trainings there and talked to a lot of other open source projects. would like to help with this effort. FreeBSD, and to update the list of users on our website. Knowing who uses FreeBSD helps our contributors know where to look for jobs; knowing what universities teach with FreeBSD, helps companies know where to recruit, and knowing what products use FreeBSD helps us determine what features and technologies to support. > We are pleased to announce that the Oregon State University (OSU) Open Source Lab (OSL), which hosts infrastructure for over 160 different open source projects, has agreed to host some of our servers for FreeBSD development. The first server, which should be arriving shortly, is an HP Enterprise Proliant DL360 Gen10 configured with NVDIMM memory which will be initially used for further development and testing of permanent memory support in the kernel. Stay tuned for more news from the FreeBSD Foundation in May (next newsletter).